Today, we had a very busy day. We started off going to get both of you new shoes for the wedding that we are going to. Of course, they did not have the right size in stock for NHL. Thanks to this, we went to the mall where another store was holding a pair for us. After we picked them up, tried them on and paid for them we decided to wander around for a little while. As we were walking, I remembered that Friendly’s was having free ice cream today from 12-5. I asked Daddy if he wanted to do it and he said yes. Since it was only 12:30, there was hardly a line and we got our ice cream fast. The two of you were very surprised with the treat and enjoyed it. NHL, you decided that you wanted strawberry ice cream in a cone. JSL, you wanted chocolate, but we opted to do it in a cup to make it easier. Daddy had Apple Pie a La Mode, and I went for my usual Cookie Dough. We all enjoyed it and then went to several more stores and had a quick lunch. After the mall, we went to BJ’s to get a few things for the house and for the picnic for NHL’s class. By the time we were finished, everyone was really tired. We went home for a little while and then met Nana, Papa and Mimi at the diner for Nana’s birthday dinner. Things were a bit shaky at times since everyone was cranky, but we made it through. We went back to Nana and Papa’s house to play for a while and celebrate Nana’s birthday with a little cheesecake. It was fun watching JSL playing dominoes with Mimi. Before we knew it, the sky was getting dark and it was time to go home. We had a busy day and hope to be able to run around and have some fun around the house or at the park tomrorow. PS Your husband looks like such a fun guy! 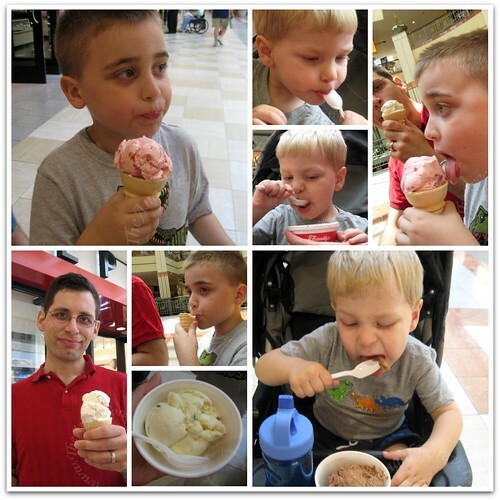 Ice cream is good – free is great! .-= RobMonroe´s last blog ..Brookside Gardens =-.